Roses are arguably the most popular flowering shrub. Roses also have a reputation for being finicky and difficult to care for, but this is just not true. Beyond day-to-day care such as watering, the only thing roses really need is plenty of sun and a little winter protection in colder areas. Some types of roses also benefit from an early spring prune. The only other maintenance they occasionally need is a few applications of garden sulphur to keep blackspot and mildew away. The large, many-petalled blooms of Hybrid Teas are usually held singly on strong straight stems that are good for cutting. Many are fragrant. They range in height from 60 cm to 125 cm tall. The blooms of a Floribunda, though slightly smaller, are produced in dense clusters. They bloom throughout the season and are generally hardier than Hybrid Teas. Showy when mass planted in beds, they generally grow to be 40 cm to 100 cm tall. Grandifloras are the largest and showiest type of rose. It blooms like a large Hybrid Tea but in clusters like a Floribunda. Vigorous and tall, a Grandiflora generally reaches 100 to 200cm tall. Climbing roses are sports or mutations of other roses. The flowers may be single or double, of Hybrid Tea or Floribunda type according to parentage. 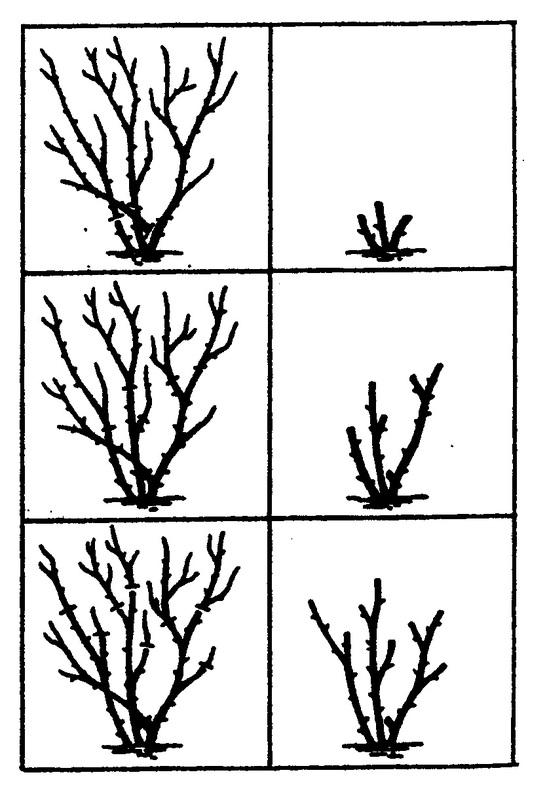 The main shoots can be trained to grow horizontally, which causes lateral branches to appear. These laterals grow upward to provide height and cover and it is here the flowers will be produced in greatest abundance. Shrub roses are greatly under-valued and under-used. Modern shrub roses, derived in some cases from native roses free of disease and insect problems, are extremely hardy and require no special care. Some are as neat as a Floribunda with flowers, as large as Hybrid Tea and many are fragrant. As an informal flowering hedge or privacy screen, they are unsurpassed. The bright red fruits of some varieties add colour in the fall and winter. Some roses have specific pruning needs. Generally, you never want to prune your plants in the fall. Hybrid Teas and Grandifloras benefit from an early spring prune to remove dead material and encourage new healthy growth for the coming season. In late winter when thawing permits, remove whatever protective material you have around your rose, be it a collar or just a pile of dirt. You will want to hold off pruning until the buds are swelling and turning bright green. You will likely be pruning before the leaves appear – this is OK. When the time is right, cut all dead stems and all weak, twiggy growth. Generally try and retain only 3 or at most 4 strong canes. You can cut these down to about 5 inches and cut to within 1/4 inch of an outward-facing bud. You’re done! Floribundas can sometimes benefit from the same treatment, but they do not need to be pruned quite as aggressively. Climbers and Shrub roses generally should never be pruned. They bloom on last year’s growth; if you prune them in spring you may not get any flowers at all. The second time to prune is in the middle of the blooming season. This form of pruning in mid-summer results in strong, vigorous, fast replacement of new blossoms and is practiced by the cut-flower rose trade. To do this, observe the arrangement of leaves on the rose stem. Under the flower will probably be a single leaf and then sets of three leaflets, then a series of leaves with five leaflets. Do not simply remove the dead flower, but cut quite low in the stem to just above the first set of five leaflets. Remember to cut to an outward-facing bud. The bud can be found tucked in right where the leaves emerge from the main stem. Stems are cut back to 3 or 4 canes, leaving short, sturdy stems about five inches long. Use for Hybrid Teas, Grandifloras or younger Floribundas. Only recommended for newly planted roses or to rejuvenate neglected old shrubs. Stems are cut back to half their length. Weak stems are cut back further. Always cut to an outward-facing bud. Use for Floribundas or very old Hybrid Teas or Grandifloras. Stems are cut back by 1/3. Lighter pruning not usually recommended as it results in tall, spindly plants with early but inferior blooms. The rose bed or planting hole should be well-prepared. Dig deep, at least 45 cm. The soil should be two parts sandy loam, one part well-composted manure and one part peat moss, plus 4 kg of bonemeal for every 10 square metres or a cupful for each plant. Choice roses are produced by budding selected types to hardy root stock. The bud union which may look like a swollen portion at the bottom of the canes should, in our climate, be planted one or two inches below the soil. Newly planted, potted roses should be fertilized with diluted transplanter according to label instructions. Established roses should be fertilized with a name brand “Rose Food”. These formulations contain many trace elements essential to the health of roses. Apply early-May, mid-June and again mid-July. For disease and insect-free roses, a combination fungicide/insecticide spray should be applied EVERY WEEK, commencing in spring as soon as buds begin to swell and growth begins. Roses should be watered deeply and well once a week. The best method in beds is to use a trickle hose that can be left running slowly on the ground, avoiding wetting the foliage and splattering soil. Cocoa Bean shells make an excellent mulch for roses. They dress the bed, conserve moisture and keep down the weeds. Other good mulches are bark chunks or shredded bark. Start thinking of over-wintering roses in mid-July, the time of the LAST fertilizing. The rose canes should be allowed to harden off and not be succulent. Reduce the watering schedule in the fall. Allow the last flush flowers to go to seed on the plant. When the ground is frozen (not too early, mid-to-late November) “hill up” the rose canes with soil (which you have kept unfrozen for this purpose) up to a maximum height of 45 cm (18 inches). Do not prune at this time unless the canes are so tall that they would whip about in the winter winds, perhaps damaging themselves or disturbing the hill of protective soil. Leave as much cane as you can. Rose collars can be used to aid in protecting the rose canes, but avoid filling up the collars with leaves — instead use mulch or soil. Where collars are not used, the hill of soil, when frozen, should be covered with evergreen boughs after Christmas, so the soil remains frozen and does not thaw in mild spells. A combination spray of Dormant Oil and Lime Sulphur should be applied to the rose canes in mid-winter (February – March). The Dormant Oil kills over-wintering forms of insects and Lime Sulphur destroys fungus spores of Black Spot and mildew. Apply in the morning of a mild day. 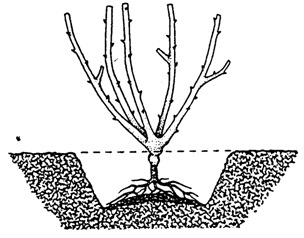 Soil at the bottom of the hole is drawn into a small mound and the roots of the rose are spread out evenly over top of it. Two handfuls of a good soil mixture should be place on top of the soil mound. The bud union should be 1 inch below soil level when planting is completed.